Charles Messier, was a French Astronomer whose work on the discovery of comets led to the compilation of a catalog of deep sky objects known today as the Messier Catalogue of nebulae and star clusters. Messier was born in Lorraine, France on June 26, 1730. His father died when he was 11, and since he was the tenth of twelve children he had very little opportunity for education. He developed an interest in astronomy as a boy after he saw the brilliant six-tailed comet of 1744. He was eventually hired as a draftsman by Joseph-Nicholas de l’Isle, Astronomer to the French Navy. During this time, he learned to use astronomical instruments. He became a skilled observer, and was later promoted to clerk at the Marine Observatory at the Hotel de Cluny in Paris. The astronomer Edmund Halley had predicted that the comet of 1682 would return again in late 1758 or early 1759. 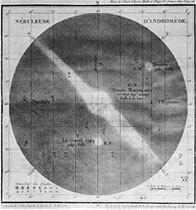 Using charts that had incorrectly been prepared by de l’Isle, Messier began searching for the comet with a small reflector telescope. He eventually located the it on January 21, 1759, but de l’Isle initially refused to let Messier announce his discovery. From that time forward, Messier devoted his life to the search for comets. In the following years he discovered as many as 21 comets by 1798. While searching on August 28, 1758, Messier discovered a small nebulous (fuzzy) object in the constellation of Taurus. It is known today as the Crab Nebula, the remains of a supernova explosion. He decided to keep a listing of these objects so that they would not be mistaken for comets in the future. The Crab Nebula, also known now as M1, became the first entry in what would eventually become the most famous list of galaxies, nebulae and star clusters ever assembled. It is ironic that Messier became famous for this listing of "time-wasting objects to avoid when comet hunting" and not for the comets he was seeking. In 1759, Messier became the chief astronomer of the Marine Observatory. He was also elected to the Royal Society of London in 1764 as well as the Paris Academy of Sciences in 1770. King Louis XV gave Messier the nickname "Comet Ferret." During a seven-month period of searching for comets in 1764, Messier added 38 new objects to his list including M13 (the great globular cluster in Hercules), the Swan Nebula (M17) in Sagittarius and the Andromeda galaxy (M31). In January of the following year he logged M41, the open cluster southwest of Sirius. Messier determined the positions of the Orion Nebula (M42 and M43), the Beehive cluster (M44) and the Pleiades (M45) on March 4, 1769. Messier also began compiling reports of discoveries by other astronomers. 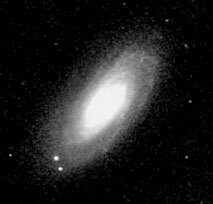 In fact, only 17 of the 45 objects in the first installment of Messier’s catalog published in 1774 were discovered by Messier himself. By 1780 the number of objects in his catalog had increased to 80. Messier made his last discovery in 1798. He continued to observe until he suffered a debilitating stroke. Two years later on April 12, 1817 he died at the age of 86. Today there are a total of 110 objects in the Messier catalog. Seven of these objects were added in the twentieth century. M110, the last entry, was added in 1967. These are among the brightest deep sky objects in the sky, which makes them favorite targets for amateur astronomers. In fact, The "Messier marathon" has become somewhat of a rite of passage for amateur astronomers around the world. The goal it to see how many of the 100 objects can be located and viewed in a single night. The Messier catalog is considered by many to contain the best deep sky objects visible in the northern hemisphere.